It has been a childhood favorite for me and my husband both but the flavors we like in a tahiri are different unfortunately. 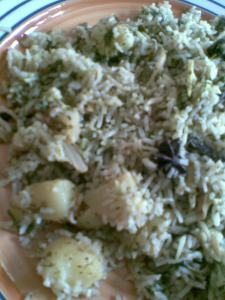 He likes his tahiri little bland, with potatoes and peas essentially and aromatic with loads of ghee. 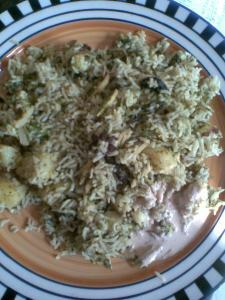 While I like it very spicy with lots of vegetables into it, no potatoes, mostly greens like spinach, sowa, methi etc. Needless to say I have to make it somewhat in between, not too spicy not to bland and I find it very easy to sneak in a lot of veggies into it by adding vegetables of different types, like here the potatoes and cauliflower pieces retain their shape while the spinach and dill greens get wilted and mixed up with rice to give it a nice green color. This kind of a preparation is a good way to make one eat a lot of vegetables without even realizing. I would emphasize that It is actually a great way of eating a lot of vegetables with small quantity of rice. Sometimes I add paneer or soy nuggets when there is no other source of protein in the meal. But here the akhrot ki chutney fills that gap. This time we enjoyed it with akhrot ki chutney which is a kashmiri specialty. I used to love it at one of my aunt's place where it was served with biryanis and elaborate Kashmiri meals. Later on I made many versions of this akhrot ki chutny adding ginger and green chillies to it because I did not remember exactly how my aunt used to make it. I had apparently lost the recipe. 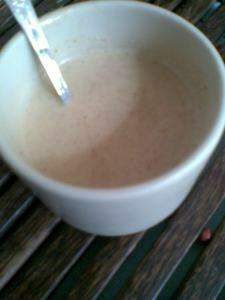 black cardamom crushed lightly 1 no. Heat oil in a pan, preferably a stock pot or a thick flat base pan. Throw in all the whole spices and the cut vegetables together and stir fry till the aroma of whole spices comes through and the veggies look slightly translucent .. Enjoy a simple and healthy tahiri with a nutty hot chutney that can be used like a dip for crackers or vegetable crudites too. With this hari tahiri this chutney feels like a perfect companion, much better than the hostel wali tahiri. Sangeeta, I made a peas pulao just the other day with some corn and carrots thrown in. But yours looks delicious. I have never used whole spices, instead rely on garam masala. But I have to give your method a try soon. It looks so much healthier with all the veggies and the chutney looks good too. I have never had this kind before. Tahiri looks delicious and yummy. 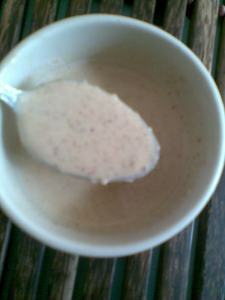 And yeah..akhrot chutney too. Never tasted it though. Will try to make it oneday. The Chutney recipe is fantastic and new for me. The Taher reminds me of good old days. 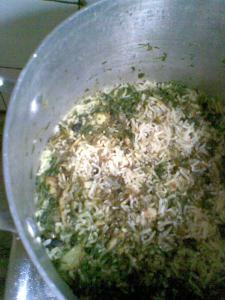 We used to make and eat lot of Tahiri in Kuwait. I like it the way your hubby likes,bland, no riot of spice. I will settle for a Vege pulao if I have make it spicy. 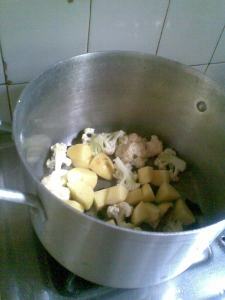 chutney is new for me,..
Sangeeta, I add peas and cauliflower florets. Your recipe looks yummy...can try it sometime. The chutney is new to me. Thanks for the akhrot chutney bit. The Tahiri looks yummy..serious nostalgia creeping in now...takes me back memory lane, when Tahiri was staple during bachelor days. This chutney is totally new to me..Great entry Sangeeta!!! Tahiri is very famous but never seen how its made till now. Thanks for sharing! Can we eat this akrot chutney with idli and dosa??? What is ur opinion? How it would taste sangeeta can u tell? I wanna make it to feed my picky eater kid!!! Yes you can. It tastes amazing with just about everything.